Which for those who aren’t paying attention to the calendar, means tomorrow. Said Nintendo will start at 2pm PT (or 10pm GMT, for those in the UK), and will cover Wii U and 3DS games being released in Summer 2016. 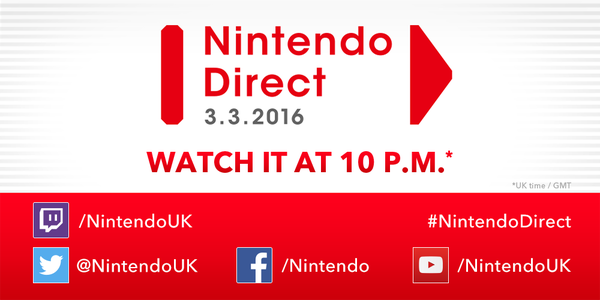 It's time for a new #NintendoDirect! We'll be live on 03/03 at 22:00 GMT! So what do we think is likely to be announced in this Direct? Well, Zelda seems to a sure fire inclusion. After all, it’s been ages since new footage of Zelda U was released, and even that was about 15 seconds worth. So it feels like we’ll be getting a proper trailer this time around, giving us some indication of how the game will actually work on a story level. Star Fox Zero seems plausible too, though it could easily be an announcement that the game’s just been delayed again. Pokemon Sun and Moon could make an appearance here, given that we’ve only seen concept art and the logos rather than any of the actual gameplay or included Pokemon. But what do you want to see in tomorrow’s Nintendo Direct?